A classic dinner-party dessert, always very popular. Preheat oven to 200°C. Make pastry, adding 1 tbsp sugar if preferred sweet, and press into 25 cm shallow pie dish. Bake about 10–15 minutes until just golden, then cool. Combine water, sugar and citric in a saucepan, bring to boil. Mix extra water, cornflour and gelatine and add to saucepan, stirring continuously until it thickens. Take off heat and stir in butter and yolks. Cool a little and pour into baked pie-crust. Beat whites to a soft peak, add sugar-salt-cornflour mixture a little at time, beating to a glossy texture. 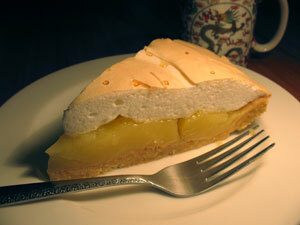 Spread meringue on pie with a broad spatula, then bake about 10 minutes at 180°C until browned. Delicious with yoghurt or cream. WARNING Avoid high omega-3 eggs as the fish oil fed to the chickens leaves a very fishy taste in recipes like this. With totally dry TM bowl, put in egg, cornflour and salt. Insert butterfly. Whip 3-4 mins speed 3.5 until stiff peaks have formed. Reduce to speed 2.5 and add sugar mixture 1 tblspn at a time over 3-4 mins.